Since I am writing 31 Days With Mary during the month of October, maybe I will begin by sharing how Mary became my queen and my mother. My first real encounter with Mary was through the quiet actions of my grandma, who had a beautiful devotion to Our Blessed Mother and who also happened to be named Mary. 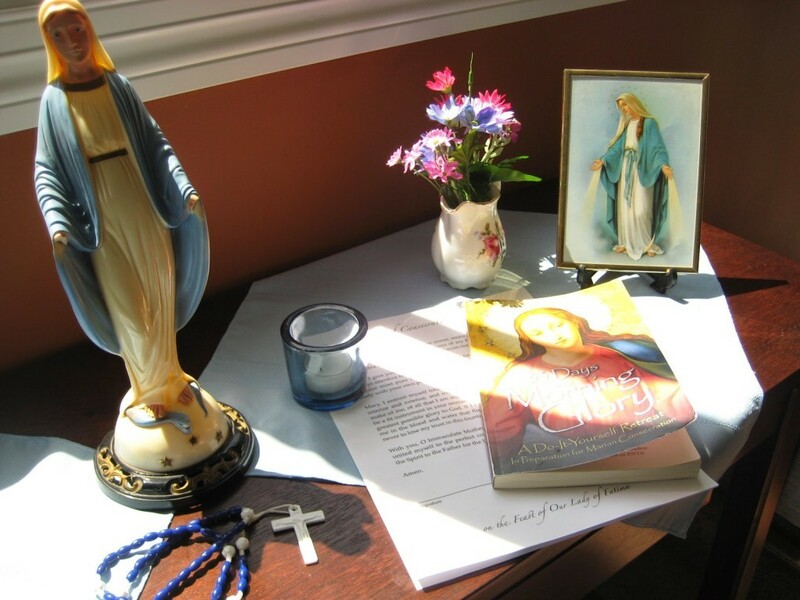 She had a simple white statue of the Blessed Mother outside her home in Arkansas, and whether she was there or traveling the U.S. visiting family members, her Rosary was her constant companion. In fact, praying the Rosary with Grandma was about the only time I prayed the Rosary growing up. Each year, my mom and I drove her from Arkansas to Minnesota to visit relatives, and before we made light conversation or listened to the radio, we always prayed a Rosary for a safe journey. When I was still young, Grandma gave me an old, albeit plastic, statue of Mary that her children gave her when they were little. On the bottom part is a music box that plays “Ave Maria.” Growing up, I kept this beloved statue of Mary in my bedroom, and even though it’s seen better days, it sits on my desk today. In my teen years, I chose Mary as my Confirmation name, after my grandma, and I can now see how she and Mama Mary are strong intercessors and spiritual mothers in my life … and always have been. But between those growing-up years and the present day, I honestly did not think very much about Our Blessed Mother. I never had any problems with what the Church teaches about her. I just didn’t do anything to cultivate a relationship with her or a devotion to her. Until about six years ago. In 2009, Mary began entering my mind and heart more regularly. I started gazing at her statue more at church. I began noticing Mary in artwork and reading quotes that pertained to her. Our pastor made frequent comments about Our Blessed Mother, including dedicating our children to her, and I wondered what that meant. 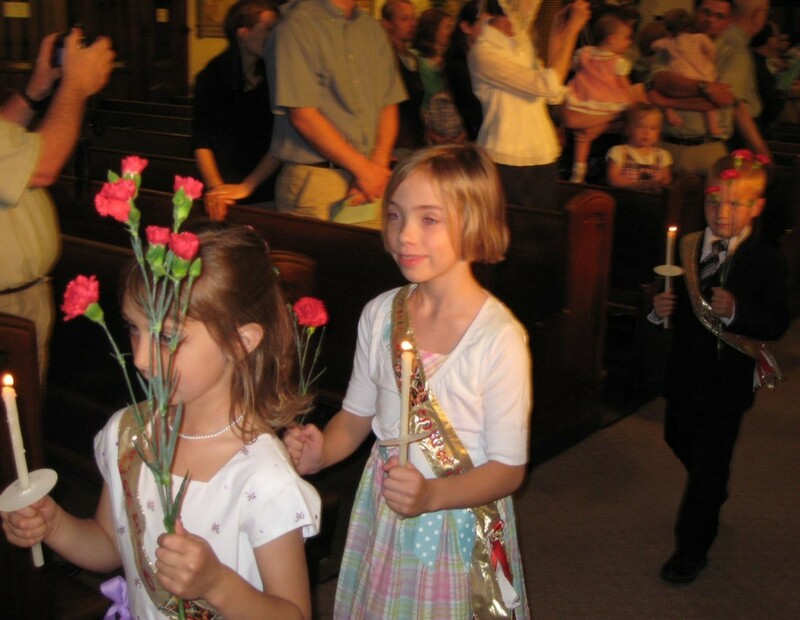 That same year, my children’s school honored Mary with a May crowning, which was a brand-new experience for me. The children processed into church with candles and flowers for Our Blessed Mother, some of the older boys carried her statue in on a special pedestal, and the First Communicants crowned the Queen of Heaven and Earth. We recited the five glorious mysteries of the Rosary in the presence of the Blessed Sacrament as well as sang songs in honor of Mary. I was moved by the beauty and reverence of this sweet ceremony. Through Father’s homily that evening, I also started to understand more clearly who Mary is in the course of Salvation History. I learned that we are to “… [give] respect to whom respect is due, honor to whom honor is due” (Romans 13:7). Mary’s yes to be the Mother of God was freely given (which means she could have said no.) And because of her yes, we received Christ. She gave us the greatest gift and therefore is the greatest benefactress to the human race, and so she is most deserving of our devotion and honor. In the book of James, it states that fervent prayer of a righteous man avails much. The more holy the person, the more powerful her prayer. Because Mary is the most holy of all humans, her prayer is most likely and worthy to be heard. Therefore, we must go to her for her intercession of our imperfect prayers. For “Mary’s will does not differ from the will of God,” said St. Maximilian Kolbe. Mary’s role, her purpose, her importance really started to click for me, thanks be to God. It was as if everything was lining up and making sense. A whole new world, new dimension of my Faith was opening up before my eyes. Mary was inviting me (and my family) into a deeper, more intimate relationship with her as well as with her Son. But like any good mother, she is so very patient and gentle with her children. Right around this same time, my husband expressed his desire to increase our devotion to Mary as a family. His comments confirmed what was going on in my heart to be truly sent from God, and it sealed the deal for me (so to speak). My family and I started doing simple things to honor the Blessed Mother. 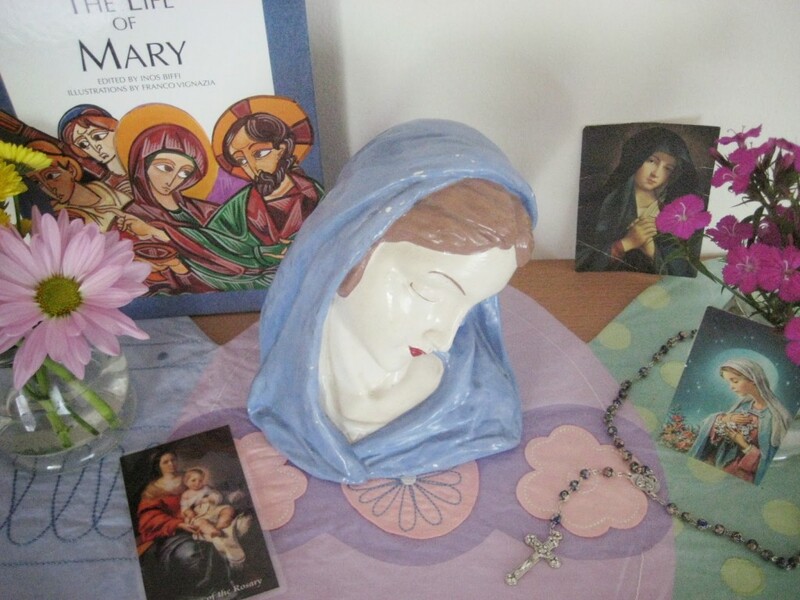 We picked up the ageless tradition of making a Mary altar in our home during the month of May. It started out (and remains) very simple with holy cards, a Rosary, maybe a statue and some flowers. 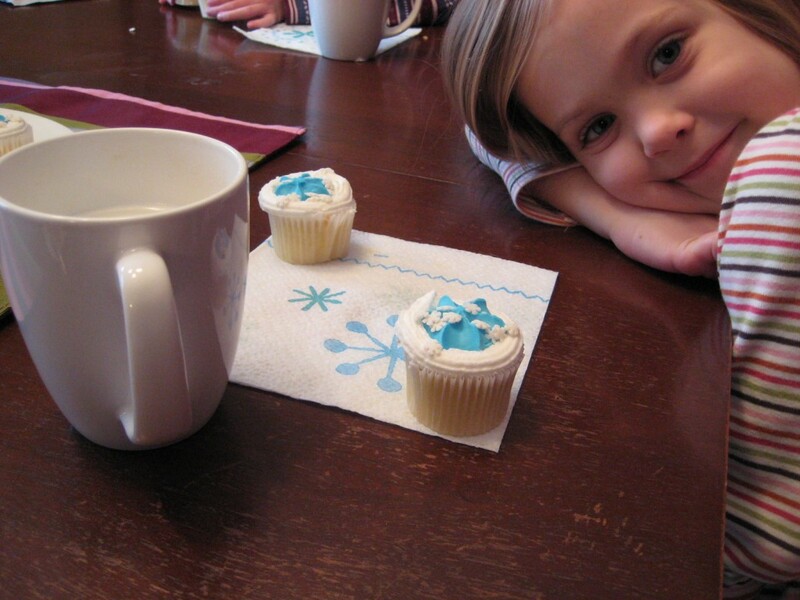 Through various Catholic blogs and resources, we learned to celebrate Marian feast days with little tea parties and other activities. And personally, I started collecting quotes about Mary that popped up in my inbox, and I noticed that an overall theme of these quotes was the idea of growing closer to Jesus through Mary’s guidance. I wanted to know more. I had read about St. Louis de Montford’s Marian consecration, and I attempted it a couple times. But for a young mother, it was hard to get in all of the prayers (and since then, I have heard that it’s not just hard for young moms!). So, Marian consecration remained on my spiritual “to-do list” for a couple years. Then, in 2012, by the grace of God, I heard about the book 33 Days to Morning Glory by Father Michael Gaitley. And I was excited about the simple, doable format of drawing closer to the Blessed Mother and ultimately to Jesus. I invited my husband and my mother (who lives with our family) to join me in reading this book that would lead to Consecration to Jesus through Mary. Neither of them really knew what they were getting themselves into (nor did I), but they both agreed without any question or concern! The book opened up a whole new aspect of our Catholic Faith to me. I not only grew in my understanding of Mary’s role in leading us to Jesus. I also got to know her better as my own motherly companion. The book does a beautiful job at explaining how four saints developed their own personal devotion to Our Lady and how that impacted their lives as model Christians. My entire review of the book can by found here on Goodreads. On May 13, 2012, my husband, my mom and I made our Consecration to Jesus through Mary on the Feast of Our Lady of Fatima, 2012. The graces that flowed from that day continue to unfold before my eyes. We added a Mary garden to our backyard in honor of our consecration. This is something that I had been dreaming about for several years, but with moving and having babies, I had to be patient! Since my initial consecration, I have re-read 33 Days two more times, each time renewing my consecration to Mary. The last time was in the summer of 2013, and every morning, I sat on our front porch, read my reading, said my prayers and just envisioned Mary sitting on the rocking chair next to me, as if we were at her house in Nazareth. I truly felt her presence, as I trusted her with all of my needs, worries and concerns. She was teaching me how to deal with them through prayer and trust in God’s providence. Again, Venerable Archbishop Fulton Sheen once said about Mary, “Only she who raised Christ can raise a Christian,” and that’s how I feel about Mary’s influence in my own life. Mary enters my mind and heart frequently, certainly several times a day. I wonder how she would handle the ins and outs of daily life in 2014. How would she help with homework? How would she keep the house clean without yelling at the kids? How would she manage the laundry of a family of eight? How would she manage the grocery budget? How would she discipline in today’s world? The list of my questions for Mary is endless! I don’t always know for sure what she’d do, and I’m sure I don’t always act the way she would, but I find comfort in knowing she is walking with me in this journey of motherhood. And really, whenever I reflect upon her prayer and intercession in my life, I cannot help but notice Jesus closer to me than ever before. 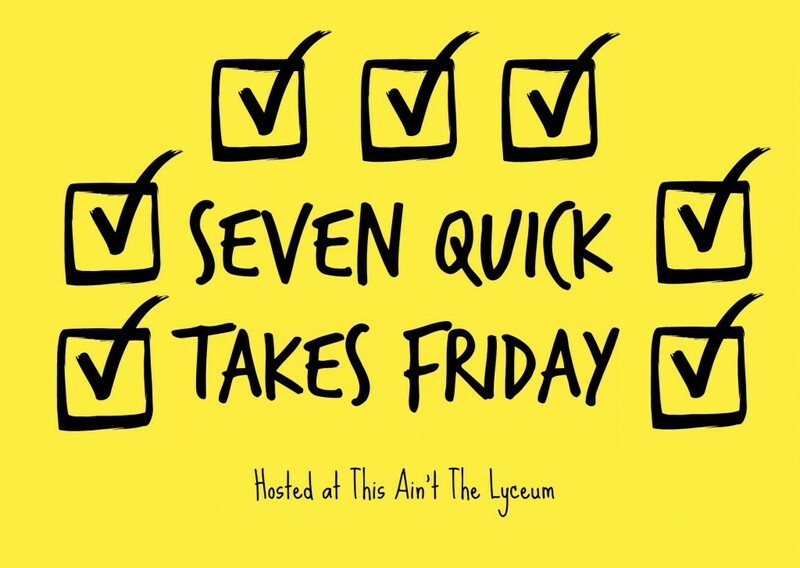 For more Quick Takes, please visit This Ain’t the Lyceum. 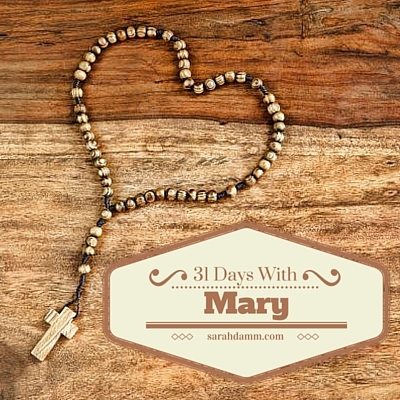 Day 1 :: 31 Days With Mary—Welcome! That was a beautiful story of your journey into Mary’s arms. Thank you, Barbara! God bless you! I just want you to know that I have really enjoyed your blog lately. Thank you for writing! Thank you, Tacy! I appreciate your comments! Have a blessed day! Beautiful Sarah. I love hearing how others have come to have an intimate relationship with our Lady. Thank you, Jenny! I love hearing these kinds of stories, too! Lovely Story, Sarah! Like you, Consecration to Jesus Through Mary changed my life journey. 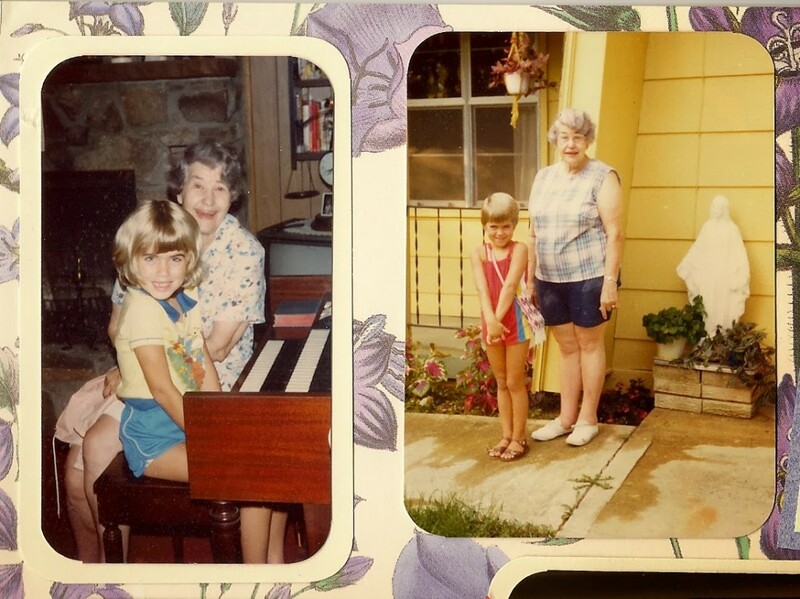 I could regale you with stories galore about Mary, My Mother, and her tender care over my family from my mid childhood through my great grandchildren’s lives now. She truly looks in over the windowsill of every family where there is a consecrated soul, to see what Wine of Blessing is needed and goes to Her Son to ask for it, for each and every consecrated soul. We are blessed with such a Mother! Bless you! Oh, Carol! You wrote such beautiful words about Our Lady! We are so blessed to have her as our mother! Jesus is so generous with us! It overwhelms me with joy when I think about being a daughter of God and of Mary! Wow! What a beautiful post, thanks for sharing! Reminded me of my various experiences with Mary (of which there are few — I’m a convert of 3 years) but one of the big ones was my daughter. I remember her father and I in a big fight, and we were sitting in a rose garden with a statue of Our Lady, at night, at a local church. I was praying for our relationship that I thought was falling apart. There were a few slugs crawling around and it was cool and dark and so beautiful, so calming. We made it through, had our daughter (who was due in May! The month of Mary!) and decided to name her Miriam Rose, partially in honor of Our Holy Mother. When I was afraid of the pains of labor, I thought of her giving birth in a stable and what that must have been like, and how she was just fine, and I felt peace. Anyways, thank you for all your words, and for reminding me of these things. Stopping by from 7QT! Hi Michelle! Thank you so much for stopping by and for sharing your beautiful Mary story! I just love hearing how others have come to know Mama Mary! God bless your day!